Are Tungsten Rings Beneficial for People Who Are Allergic to Metals? Some people have allergic reactions to different types of metals. This type of allergy is considered a “contact allergy” because it is only triggered when the skin comes into contact with the allergen (i.e., the metal that came into contact with your skin). Just like other allergic reactions, the body responds by releasing histamine and antibodies to fight against the allergen. The body’s response is what triggers the skin irritation, which can result in itchy, red skin or even small blisters. 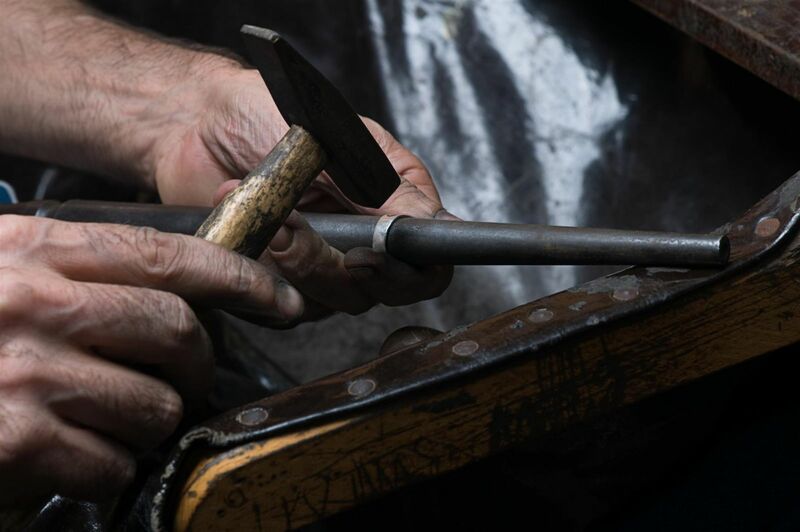 In many cases, the person does not even realize they are allergic to metals because the body must first come into contact with the metal for a short period of time. It is after this first contact that the body reacts and the skin becomes sensitive to metals. The next time you wear a certain ring or another piece of jewelry with the same metals, then you could experience an allergic reaction. Furthermore, some people can go years before their bodies have an allergic reaction. It is not unheard of for a bride or groom to wear a wedding ring for several years and then, one day, wake up and have an itchy skin rash on her or his ring finger. Due to the processes to make jewelry where other metals are combined into alloys, many types of gold rings can cause allergic skin reactions. The costs to get pure, non-reactive gold can be very expensive and costly. In addition, if you already had an allergic reaction to gold alloy-based rings, your body could still experience a reaction to a pure gold ring. What Are Some Hypoallergenic Options? Platinum– Platinum is a rare precious metal and can be much more costly than even pure gold. This often places platinum rings far out of reach for most people. Titanium– Titanium costs much less and is a good option for some people. Due to the simplicity of the rings, they look basic. Additionally, titanium is a soft metal and scratches easily. 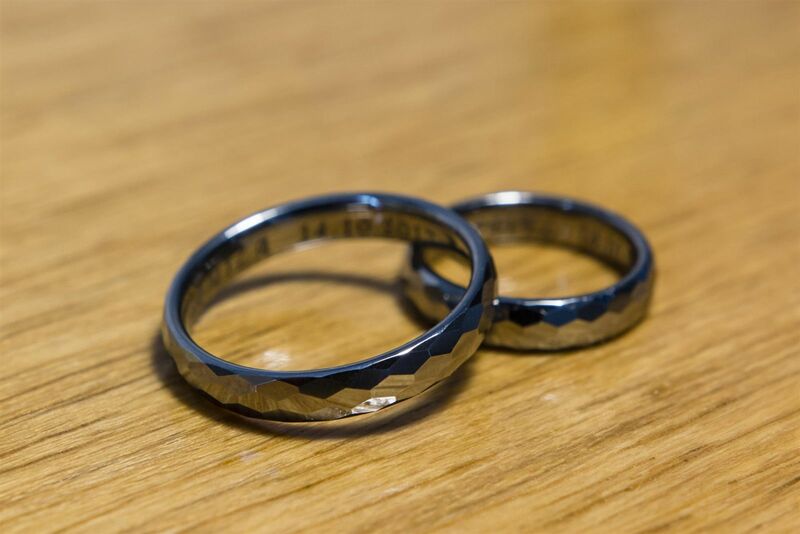 Tungsten– Tungsten, by itself, is a soft metal and can be a good option for a wedding ring. It is very affordable, but it does scratch like titanium. Tungsten Carbide– When tungsten is combined with carbide, it becomes rather hardy and strong, making it scratch resistant and very durable. 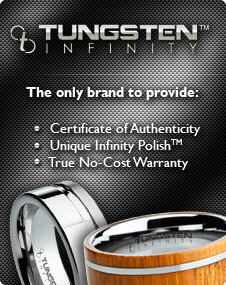 Just like tungsten wedding rings, rings made from tungsten carbide are not expensive. Out of all of the above options for hypoallergenic rings, tungsten carbide is one of the most popular. Rings can be brush finished in different styles, as well as laser etched to create truly remarkable and unique rings. Verify the ring was made using nickel alloy, not cobalt. Nickel alloy takes on the hypoallergenic properties of tungsten, while cobalt will not. Ring sizes need to be accurate. Since tungsten carbide is very hard, making ring size alterations is not possible. To learn more about tungsten carbide and the wide selections of affordable tungsten carbide rings, please feel free to contact Men’s Tungsten Online at 1-800-699-8076 today!